Are you worried you might never sleep again? Does the idea of moving your toddler from a crib to a shared room sound like a nightmare? You might be surprised! This post contains Amazon Affiliate links for your convenience. Sleep is precious at our house. 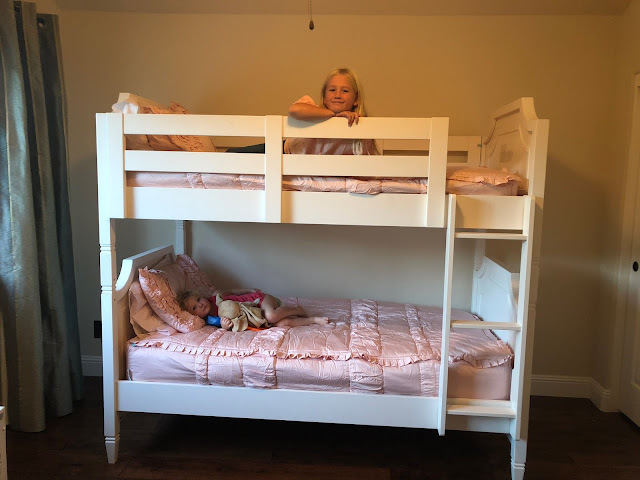 With four kids ages 3-11, we pretty much feel like we've been sleep deprived for almost 11 years... so the idea of transitioning another kid from their crib to a bed wasn't something I was in a rush to do. In fact, my goal was to let my youngest stay in her crib until she was busting out of it... or ready to go to kindergarten. My husband, on the other hand, had a different opinion. A few months ago he told my toddler that she could move to her big bed in her new room when she turned three... on her birthday. I didn't have the heart to say no... since she was so excited, so we went for it! We used several of these strategies from our toddler crib to bed transition post along with the ideas below. Here are some of my favorite tips for moving a toddler from a crib to a shared room! 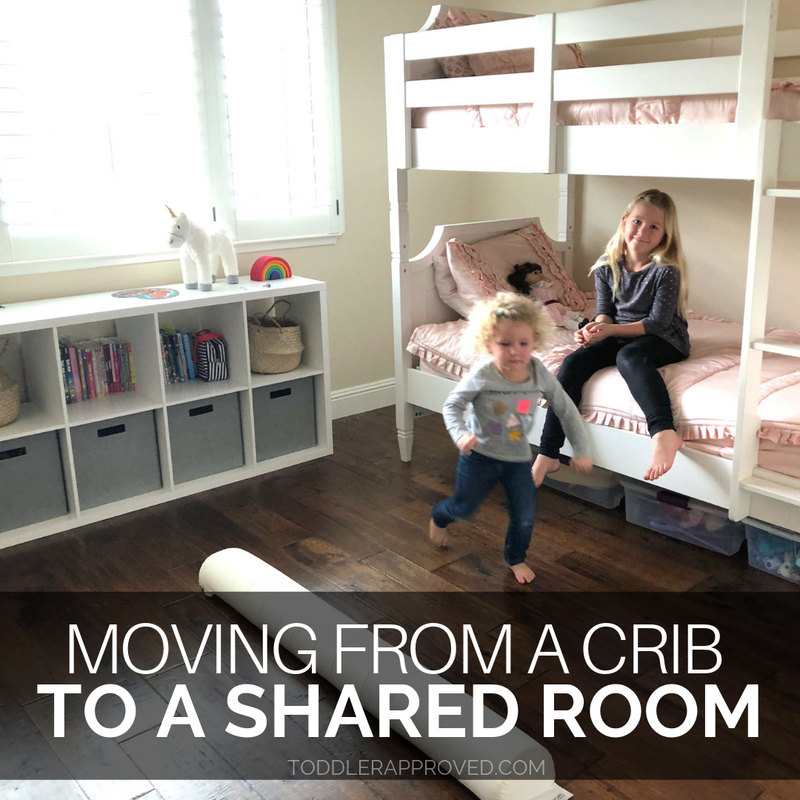 These are my own thoughts and opinions on transitioning from a crib to a shared room. Your family might have another process that works for you! Each kid and family will be different. Before we moved into our new house about 4 months ago, we started the conversation about sharing a room with our toddler and older daughter. Every time we talked about the new house and new rooms, we would talk with our toddler about her new big girl bed and big girl room and how AWESOME it was going to be. If you're just moving rooms within your house, spend time painting the visual picture of what sharing will look like for your kids. You can remind your toddler that her special stuffed animal (or other special items like a blanket or toy) will get to come to her new big bed. 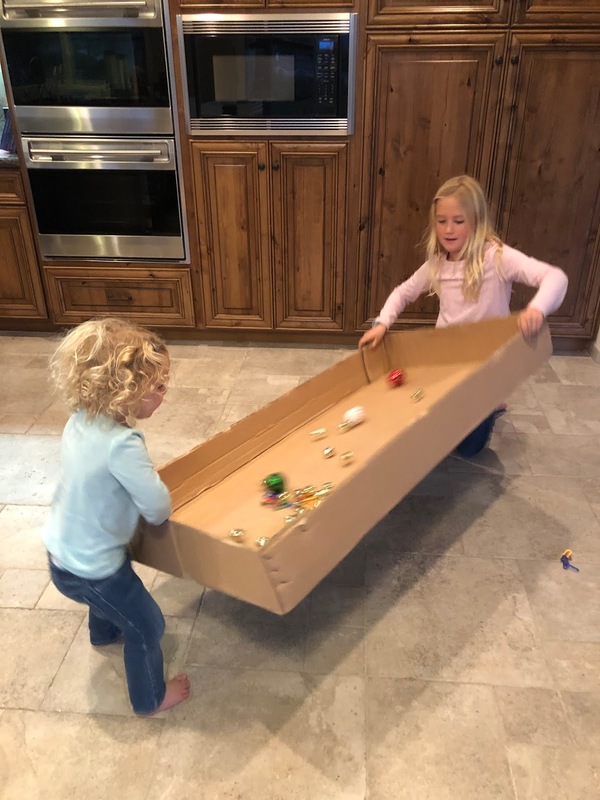 Selling the transition to big siblings can take a little creativity. After all, not every big sibling is dying to share a room with their little sister. The most important thing is to BE POSITIVE and give them several reasons why sharing a room will be fabulous. Older siblings often enjoy being helpful and getting to be leaders, so you can also share ways they can help their new little roommate and earn some special privileges in their new responsible role. Start by getting a cozy bed! 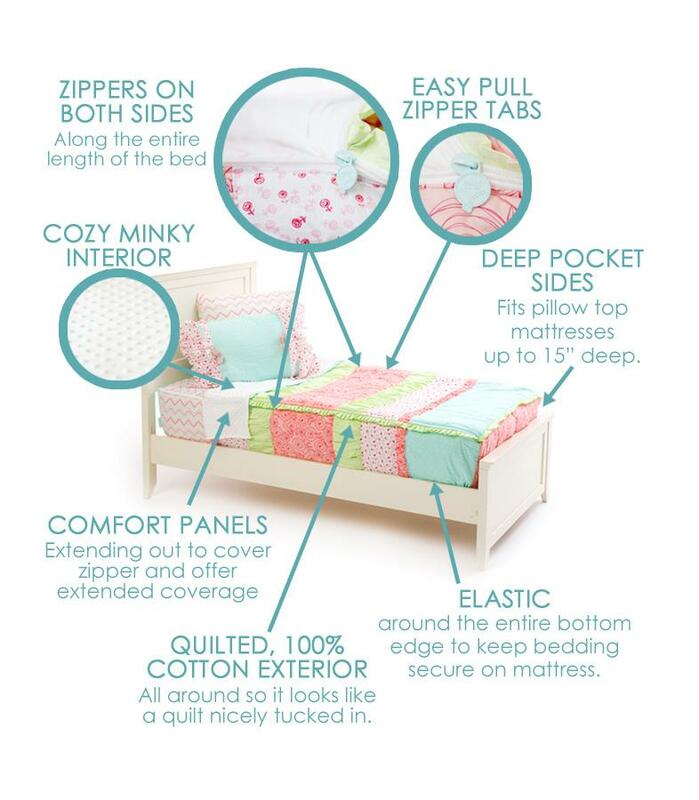 We love cozy beds for little ones that can grow with them. We typically buy a twin bed for our toddlers when they are ready to move out of their crib. We do this for a few reasons. We think a twin bed is more comfortable for everyone- including you! We did a toddler bed with one of our kids and it was so uncomfortable and small- especially for my husband who is super tall and likes to read next to the kids at bedtime. Twin beds were also cozy if a kid was sick and we needed to be nearby or if someone had a nightmare. We aren't a co-sleeping family, so we prefer to be able to hop into a kid's bed versus having them hop into ours. A twin bed can double as a guest bed. California houses aren't big and if guests come, a twin can double as a guest bed. We just make everyone rotate around and some littles sleep on the floor. A twin bed allows kids to move around more! Our kids are on the taller side, so we knew a toddler bed wouldn't last long. Our daughter slept in it for less than a year. Our kids move a lot while they sleep and a twin bed gives them a lot of space for that which then means they wake up less. Whether you use a twin bed or a toddler bed (or a mattress on the floor) doesn't really matter. Whatever works for your child is what is best! This last time around we bought our kids a BUNK BED... so still a twin, but a little bit different. When we set up the room, we prepped our toddler that she would be sleeping in the bottom bunk. Next, Get Helpful Toddler Room Gear! Bed Rail- Once the bed arrived, we purchased a Toddler Bed rail. We picked the Hiccapop Toddler Bed Rail/Bumper because it looked cozy and had great reviews on Amazon. We had one of those mesh fence-like things with some of our others kids and hated it! Kids would goof around with it, bump themselves on it, and I even got hurt putting it away. This soft bumper was hands down so much better. It stays put and keeps the toddler feeling surrounded. Next, we moved the bed against one wall so the bed only really had one exit point and that was where the hiccapop toddler bumper was. We also made sure the room is toddler proof and anything that could fall over is bolted to the wall. 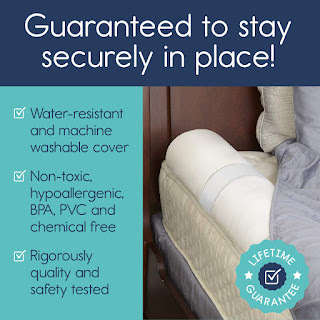 Kid-Friendly Cozy Bedding- After that, we ordered cute zip up bedding from Beddys Beds so that our older daughter could take responsibility for easily making the beds each morning and have the toddler help her. Video Monitor- Next, we set up a video camera monitor in the room to keep an eye on what everyone is up to. We love Nest Security Cams. I love that the video is high quality in the daylight and dark and that there is a built-in speaker and microphone. 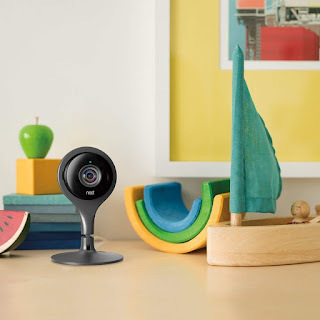 I also love that the Nests are versatile and when we no longer need a video camera on the toddler, they can be used as a security camera somewhere else in the house. They also have an amazing app which can work together with your heating/cooling system and your home security. 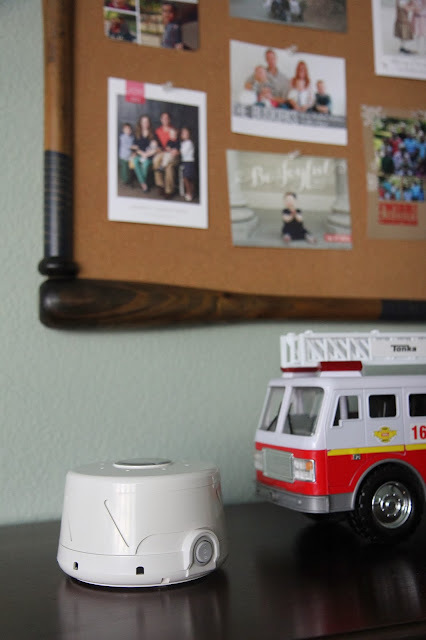 White Noise- Finally, we moved their white noise machine into the room to help everyone feel comfortable. Both girls used a sound machine before they combined rooms, so that made the transition easier too. We love the Marpac dohm sound machines. Locks- We used toddler locks on the doors with our first two kids, and then with our other two kids we didn't. You know your own child, so if you are worried about them roaming the house in the dark and getting into things, you may want to consider a toddler lock or a gate. I also learned with my more sensitive child that having a lock on the door was damaging our relationship and her security. The move to a big kid bed can make kids really feel insecure, so instead of locking the door, I sit inside the room during the transition and act super boring. Over time I move to right outside the door and then away. 3. Make the room "theirs"
Create some special opportunities for the new roommates to do some fun things together in their room. Have the big sibling go through her belongings and move anything fragile or extra special up high. Have her pick some places where the toddler can put her own special belongings. Bring the special items into the new room. Have the big sibling help bring some of the toddler's books into the room and read together too. Help the new roommates create some happy memories together during the daytime in and out of the house. If you can, take some photos of them together and put them in frames or on the walls or put together a special sibling photo book of photos of them together. Practice having the roommates hang out in their rooms so they are used to being in there together! Big siblings love to show little ones around, teach them the rules, and help them try doing some pretend "sleeping." Set a date for when the transition will happen. Get some good sleep ahead of time if you can. I always stock up on chocolate ahead of time (Cadbury mini eggs) and Diet Coke since I hate change and tend to get stressed about stuff like this! For the first few nights of the new transition, we staggered bedtimes. The younger sibling went to bed first while the older sibling got to stay up to read and play super quietly in another room. This made the transition special for the big sib. My older daughter was excited to get to stay up a little later. This also allowed my littlest to settle in without any distractions. 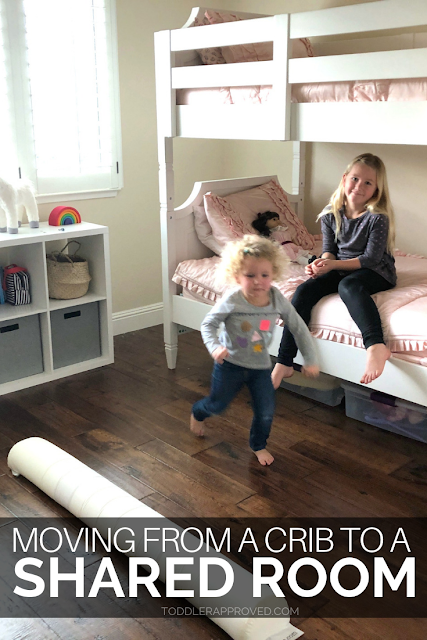 Often when we move a toddler to a shared room, we still have to go through the normal adjustment period of moving from a crib to a big kid bed. If your older child is able to be flexible, you can also move the older child out of the bedroom temporarily during the transition. Put him or her to sleep on an air mattress or futon in your bedroom and move her back once the little one is asleep. Each kid will be different. In my youngest's case, she went to bed faster with her sister in her room. She liked the comfort of knowing someone else was there. With my boys, they go to bed faster when bedtimes are staggered. 6. Include a transition object! Does your child have a pacifier, special stuffed animal, favorite blanket, or even a little favorite toy? Use that object to help with the transition to the new big bed. My youngest hates bedtime sometimes, but if she knows that she can bring her tiny Paw Patrol guy into bed, she's great. Teach your big kids and toddler what time is ok to wake up. Right now we say that she can't get up until it is light outside. 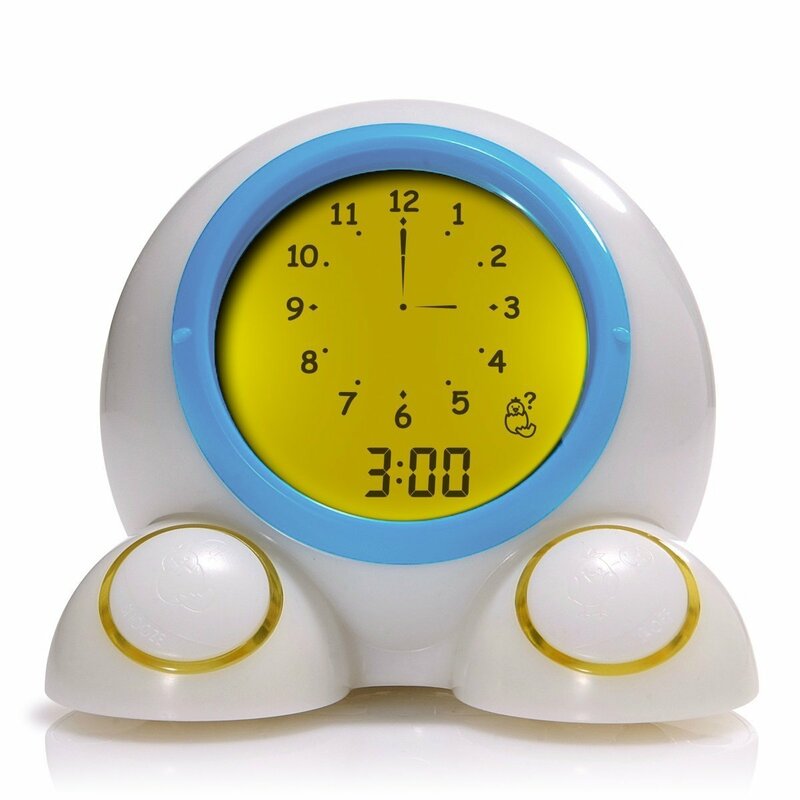 Once it gets lighter in the morning, we have one of those talking alarm clocks that can tell kids when it is ok to get out of bed. Kids are not robots though, so no matter what you do, they may still wake up super early depending on how much sleep they need. At our house, we train our kids once they are four to go down and get themselves cereal or yogurt for breakfast. The big kids can get themselves dressed and help the little kids get food as well. So, in the morning, once it is light (and a decent hour), our big kids help the littler ones get food and then they go and play in their rooms or our playroom. I've worked myself out of a job and it is fabulous! Each house and family will be different though. Just because they get themselves breakfast, doesn't necessarily mean that they are always quiet! 8. Sit back and let them adjust! Just like any transition, there will be an adjustment period. Some kids will have an easy adjustment and some kids will have a harder time getting used to being in a room with someone else. Kids that are more sensitive or are light sleepers can struggle more than others. Let the kids try and work it out before jumping in. You've got your monitor, so you can watch from the other room and make sure everyone is safe and being smart. Often two kids in a room lead to some pretty dumb decisions... so obviously keep an eye on things. You can also see how many times your toddler adjusts her blanket or gets up in the nighttime. LOL. Annabelle was up 140 times in 30 minutes at the beginning! I promise, eventually everyone will sleep again! Be willing to change the plan if you need to. Not all kids should share a room. I love the things that kids can learn from sharing a room, but it isn't the best for all relationships and personalities. Even within your own family, what might work for some kids won't work for others. Be willing to adjust if it just isn't working. You might have to come up with some other creative solutions. Bigger siblings can have a hard time all of sudden having their space and style cramped by having a little sibling around and in their room all the time. Help the adjustment go smoothly by supporting letting them have sibling-free alone time in their room or another part of the house during the day. What happens if little siblings wake up big siblings in the nighttime? It will probably happen. Don't get stressed about it. Everyone will get used to it eventually, but at the beginning there might be some growing pains. Have a plan in your mind ahead of time of what you will do. That will help you feel less stressed. Will you take the little sibling out of the room? Will you go lie with the little sibling for a bit? Having a sound machine will help a bit with making sounds less loud. You can also teach older siblings strategies for dealing with loud little siblings. Start by prepping them that their sister or brother will probably be loud sometimes. Remind them that they are learning and to just try and ignore it. What about if siblings are constantly getting out of bed? Often kids are great with room transitions at the beginning and then the honeymoon period wears off and they start goofing around. My husband and I will usually take turns sitting in the room or right outside the bedroom door until everyone is asleep. Sometimes we set up a contract with the kids where they get stickers when they stay in bed. If they have a certain number of stickers on their sticker chart in the morning, then they get to do something fun like watch Paw Patrol right when they get up or get a little treat or a little prize. I'm not beyond rewarding kids to stay in their bed so that we can all get sleep. We start by doing a system every night for a week or two, then move to every few days, and then once a week, and then we fade it until it is gone. I promise your kids won't need a sticker to go to sleep once they are in college. Surprise Shoes- One fun thing we've done before if kids really need some help staying in their beds is surprise shoes. This is done intermittently, not every night. We start by putting a pair of each child's shoes outside their bedroom door. For as long as they stay in their bed and in their room, the shoes stay outside their door. If they come out, we take a shoe. The shoes that are still outside the door once they fall asleep get filled with candy or prizes. In the morning, they get to enjoy the shoe filled with surprises. I also love these suggestions from AHA Parenting for when kids keep getting out of bed. They work great for keeping a secure relationship. What if my kids won't stop talking (or singing?)?? This is actually my favorite part about room sharing. It totally bugs me sometimes that my kids talk and talk, but I also love it. I am a twin and grew up sharing a room. My sister and I fought hard and also told each other everything. She is my best friend today because of the fun we had sharing a room-- especially our late night chats. So, put them to sleep a little bit earlier and let them chat for a bit. Pretend like you don't hear it... at least for a little bit. Then after awhile you can go and remind them of the rules and get them to sleep. My toddler also loves to sing herself to sleep. We've taught my older daughter to just put a finger in her ear if it bothers her. Kids learn a lot about patience and tolerance from sharing a room! Which should I do first, potty training or moving my toddler out of her crib? I'd say, move her out of her crib first. Once your toddler is ready to be potty trained, she'll probably want to go to the bathroom at night. It will be easier if she can get out of bed versus have to call to you to carry her out of the crib. If you don't plan to night train and your toddler will wear pull ups at night, then the order of these events doesn't matter. If my toddler isn't climbing out of her crib, does she need to move to a big bed? Nope. There is no perfect time. Gauge it by how you feel and what your toddler thinks. Don't worry about your child's age either. What works for one doesn't necessarily work for you. If I could, my kids would stay in cribs until they're in kindergarten! I usually start the crib to bed transition at night time. My kids notoriously push back at nap time, so it isn't involved in this transition. Often I will keep nap time in the crib with separate rooms for both kids until my littles are really pushing back or don't need a nap any more. In the meantime, I can still enjoy some peace and quiet at nap time knowing everyone is in bed or quietly in their room. Once my kids transition away from nap time, we establish quiet time. What other questions do you have about room sharing and moving a toddler to a shared room? Although I'm not an expert, I'm happy to answer what I do know or refer you to someone else who might have an answer!